We have heard the Disney version of Snow White, read it, memorized it, and figured that was all there was to it. The Disney version is actually one I prefer my young ones not watch as I don't care for witches in stories. 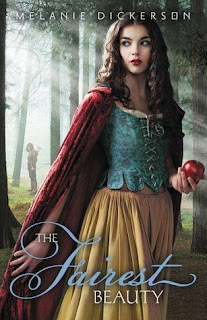 Melanie takes a classic tale and adds in a strong faith in Sophie (Snow White character). Duchess Ermegard, stepmother of Sophie is extremely jealous of the love the Duke has for his daughter. She gives the infant a drug to put her into a deep sleep, convincing the Duke she is dead. With his heart broken, and unable to love the Duchess, it is said that she killed the Duke in anger. This left the Duchess heir of Hohendorf. Sophie is raises as a servant, never knowing her true heritage. The Duchess in fact, treats her much worse than the other servants in the castle. Pinnosa, an elderly woman from the household is able to fake her death and escape the fortress to go for help. She seeks to find someone to rescue the now 16 year old heiress. Pinnosa goes to Duke Wilhelm for aid, his son Valten had been betrothed to Sophie when they were still infants. Valten with a broken leg is unable to go rescue Sophie, and younger brother Gabe senses the urgency of the matter while Valten and the Duke do not. Gabe steels away in the night to go and rescue her despite his parents insisting he wait for Valten to go. Gabe manages to help Sophie escape in a well detailed, exciting adventure. Gabe of course starts to fall for Sophie, though she is pledged to his older brother. Gabe and Sophie find safety in the cottage of seven.. seven little men! I loved the embellishments Melanie added on these little men. I loved matching up her characters to the Disney version to see what she changed with each one. I loved Melanie's men much more! The twists and turns in the story add so much more to this 'fairy tale'. Though set in Renaissance days, it tends to have more of a contemporary flare to it. It was like a movie playing in my mind with all of the rich details. The addition of Sophie's faith makes this story all the more enduring!! Get your copy from Amazon when it is released Jan 8th! Thanks for the review, Melanie! I'm so glad you liked it! God bless! I definitely want to read this one! Putting it on my wish list right now. Snow White is my absolute favorite. Thanks for sharing your review!